This is AcaciaTV streaming video workout is the perfect place to start if you are brand new to exercise or have chronic joint issues such as arthritis. Most of the workout is done lying on the floor. All of the movements are gentle and careful. If you want, you can view the detailed instructional video at the top of the video to ensure you are placing your body safely and correctly in the routines ahead. Created by Vijay Vad, MD, a top orthopedic and sports medicine specialist with Hospital for Special Surgery in New York City and led by expert instructor Stephanie Culen, all three routines draw upon yoga and Pilates to reduce pain, enhance mobility, and lessen your dependence on medication, regardless of your current fitness level. You will start by increasingly flexibility, then gradually build strength and endurance. 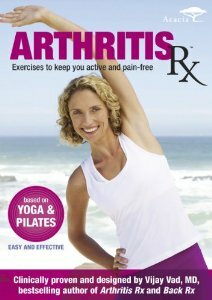 I highly recommend this series if you have any back, neck or knee problems from arthritis or for any other reason. It’s so careful and precise it should only ease, not aggravate, joint aches and pains. All you need is a mat. Sun Salutation. Largely lying on the floor, this practice is completely doable even if you are brand new to exercise or have chronic joint issues. 18 minutes. Beginner Core. A gentle introduction to core work that shouldn’t stress out your back or neck. The moves in this routine are slow, deliberate and safe with an emphasis on prepping your core for deeper work in the future. 20 minutes. Introduction to Pilates and Yoga. Ease into Pilates with the most basic variations of its signature moves such as The Hundred and Leg Circles. Then move on to Yoga poses that begin to challenge balance. Slightly more advanced than the rest of RX Arthritis work. 15 minutes.